The Mississippians who joined the Union 1st New Orleans Infantry Regiment in late 1863 and 1864 signed enlistment documents pledging “true faith and allegiance to the United States of America.” The agreement specified a three year term of service and stipulated their military duties would be restricted to “the defences of New Orleans.” In the wake of Gen. Nathaniel Bank’s failed Red River campaign, Southern forces remained active in central and northern Louisiana. But the Union had achieved control of entire Mississippi River and New Orleans was secure. Thus the Mississippians had every reason to feel confident that they would not have to shoulder their weapons against Confederate units. Upon enlisting, the recruits received a bounty of $25. An additional $75 would be collected when discharged. In hardship cases soldiers could also request an advance on their first month’s pay of $13. In July of 1864 the base pay for privates was raised to $16 per month. However, payroll was issued at irregular intervals and sometimes months elapsed between payments. The Piney Woods men came from a sparsely settled region where much of the population wrestled a frugal living from herding and small scale agriculture. Several times a year herders drove their surplus livestock to Mobile, Alabama, so the soldiers may have had some exposure to city life. But Mobile’s population of less than 30,000 paled in comparison to New Orleans’s 175,000. Strong traces of the city’s French-Spanish heritage remained, combined with African-American influences from both slaves and a community of free persons of color. During the 1840s and 1850s the city’s dominant role in the cotton trade prompted an influx of Northern businessmen and emigrants from Germany and Ireland. The Mississippians serving in the 1st New Orleans Infantry performed their duties amid the many strange and unfamiliar aspects of life in New Orleans. Records suggest they were housed in newly constructed barracks just north of the city. Other soldiers in their regiment were a roughly equal mixture of Northerners and foreign-born recruits. Military reports show that the 77th U.S. Colored Troops were under the same general command, suggesting at least some interaction between the two regiments. Their normal duties also required the Mississippians to interact with the citizenry of an occupied city. The fact that they were Southerners in blue uniforms meant many New Orleanians viewed them as traitors and scoundrels—and probably had little compunction about expressing this view. When all this is taken into account, it is not surprising that some Piney Woods men had second thoughts about their Union enlistment and departed; the actual wonder is that so many stayed. And, by and large, they did stay. Before delving into their service histories, it is pertinent to compare the Mississippi recruits with their compatriots. We might suspect that the Piney Woods men, being mostly independent-minded yeoman—many of whom had deserted Confederate service—would not measure up to their fellow soldiers. Such suspicions turn out to be wrong. Military records reveal that, as a group, the 203 Mississippi soldiers performed better than their counterparts on two key measures. A random sampling of 470 (40%) of the 1,174 soldiers with no Mississippi connection was used to make the comparisons. Despite the alien environment and their proximity to home, far fewer Mississippi men failed to report for muster or desert prior to the end of the war. TABLE 1: Service performance of 203 Mississippi enlistees in the 1st New Orleans compared with random sampling of 470 (40%) of 1,174 non-Mississippians. TABLE 2: Service outcomes of Mississippi soldiers who served in the 1st New Orleans Infantry. FAILURE TO REPORT FOR MUSTER – After a recruit signed his enlistment papers, there was often an interval of several days before he reported for muster. Some men simply pocketed the $25 bounty payment and disappeared, resulting in a file entry of “Not taken up on muster rolls.” Eight Mississippians enlisted but were not mustered, or 3.9% of the total. As shown in Table 1, this was less than half the rate found in the sampling of non-Mississippians. It is doubtful any of the Piney Woods men enlisted with the intention of bounty jumping. A more probable explanation is that these recruits experienced a culture shock which they could not tolerate. Men such as James Dearman, John W. Rester, and William Spradley decided to take their chances with Confederate troops and headed back home. DESERTION – In the period between their enlistment and the end of the war, 17 of the Mississippi men deserted. Two of them, Irvin E. Elzey and Marion H. Ellis, left after serving only 93 and 99 days, respectively. Marion Ellis, who enlisted at age 18, deserted on June 2, 1864 only to be arrested six days later. He was charged with being absent without leave, having stolen a gold watch from a prisoner of war, and using insubordinate language. Sentenced to 18 months confinement, he was released under a general order and given a dishonorable discharge on December 29, 1865. At the other end of the age range, Irvin Elzey was grey-haired and 43-years-old when he signed up on April 28, 1864. He received a promotion to Corporal on June 1, but was listed as having deserted on July 30. Descendants report that he died in November 1864 as a result of a train derailment in New Orleans. The remaining 15 men who deserted prior to the war’s end did so only after serving an average of 288 days. Many made the unfortunate decision to leave in the early months of 1865. The choice was unfortunate because in the 1890s Congress passed increasingly lenient pension legislation to curry favor with Union veterans. Provisions were added allowing those who deserted on or after May 22, 1865 to apply to have the charges removed, paving the way for pension eligibility. General Baron DeKalb O’Neal deserted on February 27 and Henry F. Davis on April 1 of 1865. Both later sought to have their desertion charges removed, but their requests were denied. The case of Albert Walters, on the other hand, illustrates how capricious military justice and the Federal pension bureaucracy could be. On November 27, 1864, Albert left his company. The 38- year-old Jones County native was apprehended a few days later, charged with desertion, and sentenced to one year’s confinement at Fort Jefferson, in the Dry Tortugas islands off the coast of Florida. A few days shy of completing his sentence, he was subject to the general release of December 29, 1865. Transported back to New Orleans, he was mustered out of service on February 21, 1866. However, because his sentence did not stipulate a dishonorable discharge, forty years later he received approval for an invalid’s pension. When the war ended, the Mississippi soldiers remain bound by their three-year enlistments. For most that meant serving until the spring of 1867. Wanting to return to their families, 44 Piney Woods men abandoned their posts between May 22, 1865 and June 1, 1866—when the 1st New Orleans was decommissioned. Of these, 31 later made successful applications to have their post-war desertion charges removed. Some men deserted and later returned to service. All such cases have been counted among the desertions. Robert Spencer left his post on July 14, 1865 after learning that his step-father, who killed his mother in 1862, had returned to Jasper County. Two weeks later Spencer turned himself in, was sentenced by a court martial panel to three months at hard labor, and afterward rejoined his company. Seaborn Tisdale, detached to Mobile, deserted on June 17, 1865. 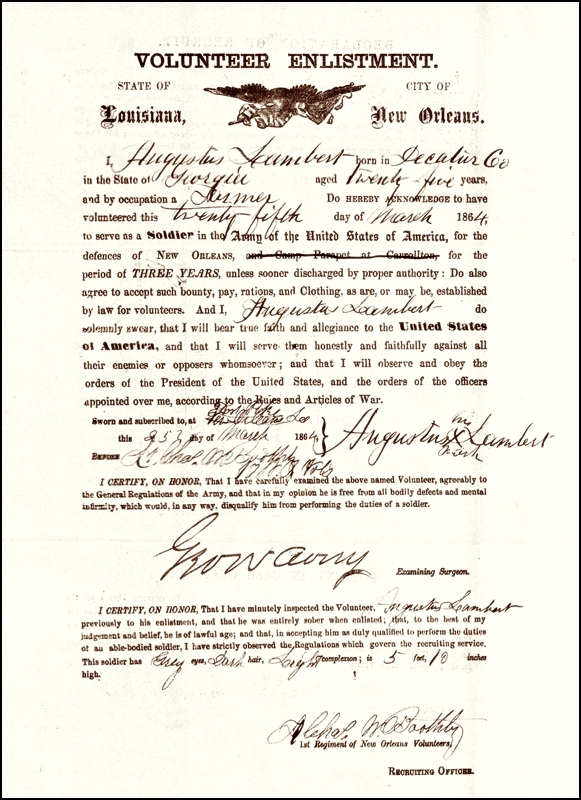 On November 6, he voluntarily surrendered in New Orleans. He was sentenced to two months in the city jail and then completed his service. MEDICAL DISCHARGES – Fourteen men received discharges prior to the end of their term of service, 12 of which were for medical disability. An example is 18 year-old Harro Bellman from Jackson County. On May 10, 1865, six months after his enlistment, he was admitted to the U.S. General Hospital for treatment of an unspecified illness. Less than a month later, on June 6, he was discharged from the hospital and military service in compliance with recently issued general orders requiring those with chronic illnesses to be expeditiously removed from the military rolls. Harro Bellman recovered, later qualified for a pension, and died in Mobile in 1920 at age 71. DEATHS IN SERVICE – The death rate among Piney Woods men of the 1st New Orleans disputes arguments that recruits were motivated by the lure of U.S. greenbacks and easy duty. Between April of 1864 and January of 1866, a total of 56 men died—27.6% of all who enlisted. The first recorded death was that of 25-year-old Augustus Lambert from Jasper County, who enlisted at Fort Pike along with 27 other men on March 25, 1864. Lambert died at the fort on April 17. Deaths mounted over the following few months: four in July, six in August, seven in September, and five in October. November, 1864, proved to be the peak month for mortality, witnessing the demise of 10 men. By the end of 1864 the death toll had reached 36. Since many of these men had enlisted with kinsmen, the Mississippians were well aware of the price they paid for their service. The causes of death, where recorded, were typically camp diseases: small pox, chronic diarrhea, and pneumonia. The high mortality rate among the Piney Woods men compared to others in the 1st New Orleans—six times greater—is a point of curiosity. The most likely explanation is that most of the other soldiers were urban residents and/or Union veterans. By the time they joined the 1st New Orleans—which did not begin recruitment until September of 1863—the more susceptible of their cohorts had already succumbed. Although over half of the Mississippians had previously served in Confederate units, they clearly arrived in New Orleans more vulnerable to disease than their counterparts. Riley J. Collins of Jones County was one of the fatalities. Later informants spoke of his adamant opposition to secession. When the first Confederate Conscription Act was enacted in April of 1862 he was exempted by age, being 36. Later that year the act was amended to include men up through age 45, but he refused to enlist. His wife Desdemonia died that same year, leaving him to care for their six children. Nevertheless, when Col. Robert Lowry led troops into Jones County to force men into Confederate service, Riley Collins made his way to Fort Pike and enlisted on April 30, 1864. He entered the U.S. General Hospital on August 20 and died 10 days later. His orphaned children were taken in and raised by a brother. The pre-war political views of John W. Axton are unknown. A native of Alabama, he moved to Perry County where the 1860 federal census listed him with a wife and new-born son. On April 4, 1862, John joined the 46th MS Infantry at Raleigh. He was sent to a hospital in Brandon in November and deserted from there. The next record of him is among the group of men who enlisted at Fort Pike on March 25, 1864. The 28-year-old died at the regimental hospital on October 11 and was buried, like most of the others, in Chalmette Cemetery. His widow successfully applied for survivor’s benefits. As noted, many of the Mississippi soldiers shared kinship bonds. There were several instances of two or more brothers joining and some cases of fathers and sons enlisting. Disease and death did not respect such family ties. David McBride, age 45, and his 18-year-old son William enlisted at Fort Pike on March 25, 1864. In late May, David was admitted to the University Hospital where on July 24 he succumbed to chronic diarrhea. One week later his son William died in the U.S. General Hospital of small pox. COMPLETED SERVICE – Sixty-four of the Mississippi soldiers remained in the 1st New Orleans until mustered out on June 1, 1866. The longest serving of the enlistees were Robert McIntire, who signed up on November 7, 1863 and Enoch E. McFadden, who joined two weeks later. Within seven months of his enlistment Robert McIntire had gained a promotion to Corporal, only to be returned to the ranks in December of 1864. Still, he displayed sufficient military tact to be assigned as an orderly at Regimental Headquarters in September of 1865. After the war he was a peddler in Harrison County and died in Louisiana sometime after 1890. Enoch E. McFadden exemplifies those whose military records indicate a dramatic shift in loyalties. He enrolled as a 2nd Lieutenant in the “Gainesville Volunteers” on July 1, 1861 and was elected Captain on October 5. The unit, thereafter identified as Company K or G, became a part of the 3rd MS Infantry. When the company held a second vote for officers in May 1, 1862, Enoch was not re-elected. A muster card simply notes he was dropped from the rolls on that date. Eighteen months later, on November 18, 1863, Enoch and two brothers, James and Milton, enlisted in the 1st New Orleans. Milton was 31 and Enoch 30, while younger brother James had just turned 18. Milton H. McFadden, whose connection with the others I only recently uncovered, joined the CSA 8th Louisiana Infantry in March, 1862. His regiment saw action in Virginia where he was taken prisoner and later exchanged. In August of 1863 he was reported absent without leave and next appeared in New Orleans. All three brothers were assigned to Company A of the 1st New Orleans. In April, 1864, Enoch and Milton were both promoted to the rank of Sergeant. On November 8 their brother James died of chronic diarrhea at Winn Island. However, both Enoch and Milton completed their terms of service. A pension application by his widow suggests Enoch died in 1894. Milton moved to Texas, was granted an invalid pension in 1890, and died in 1922. The McFadden brothers epitomize lingering questions about what motivated the Union enlistees. Early organizers of Southern units felt entitled to command and, if elections for officers did not go their way, sometimes resigned as a point of honor. But even if this were true of Enoch McFadden—and the evidence is meager—it hardly explains his change of allegiance. Nor does it explain why his brothers demonstrated a similar rupture in Confederate loyalties. For now, we can only publish these long ignored names of Union soldiers from the Mississippi Piney Woods and hope that further information will come to light. This concludes the first series of posts concerning research on the Mississippi enlistees in the 1st New Orleans Infantry. At some point, I hope to return to this topic with a table listing those who died and, when known, their burial locations and also provide more stories about some of the individual soldiers. E.P. Very interesting! Thanks for sharing, Ed. While I’m sure these guys knew they weren’t going to be participating in any major battles, I wonder if they felt they would be able to avoid all conflict as there was a rise of guerrilla warfare in southeast Louisiana beginning in 1864. According to several databases describing the history of units and so forth, the 2nd NO was involved in the Battle of Calcasieu Pass in May, 1864. Looking forward to learning more from your research, Ed! My point was merely that the enlistment document signed by most of the Union enlistees from the Piney Woods stipulated that they would be engaged in the defense of New Orleans. Terms of military service, as soldiers have learned throughout history, are always subject to change. However, by the time most of the Mississippians enlisted (Mar-Jul 1864) there was every reason to assume Confederate forces would not mount an attack on New Orleans or the surrounding region of southeast Louisiana. Whether these men were ever required to participate in any military ventures outside the environs of New Orleans is a topic for further research. In any case, their death rate from disease indicates they learned early on that their service was not without hazard. I was puzzled by statements–which I also found–that soldiers from the 2nd New Orleans participating in the Battle of Calcasieu Pass. All the more so since Calcasieu Pass is in southwest Louisiana–over 200 miles from New Orleans. Various accounts add that a detachment of about two dozen Union troops were taken prisoner. The 2nd N.O. record of events shows the regiment stationed at Fort Banks (across the Mississippi River from New Orleans) during the period. And my review of the individual service records did not indicate a group of men absent as prisoners of war. The 2nd N.O. records for Lt Haggett do confirm that he was “on special duty in Texas” during the Spring of 1864. The 2nd N.O. was disbanded in Aug 1864 and his subsequent records appear in the 1st N.O. files. These report him as a prisoner of war during the period of Jul-Oct 1864. He was later exchanged and assumed command of Company F in the 1st N.O. Let me know if you find any primary sources citing the participation of 2nd N.O. soldiers (other than Lt. Haggett) at Calcasieu Pass. I hope more material will emerge that gives us a better concept of the duties performed by these men and how far outside of New Orleans such duties may have taken them.